Sedona Cake Couture: Sedona Cake Couture Featured in New Cookbook! Sedona Cake Couture Featured in New Cookbook! Sedona Cake Couture's Pastry Chef - Andrea Carusetta-Blaut is proud to announce the release of a new cookbook titled The Sedona Table. An entire chapter is devoted to Andrea's phenomenal desserts! 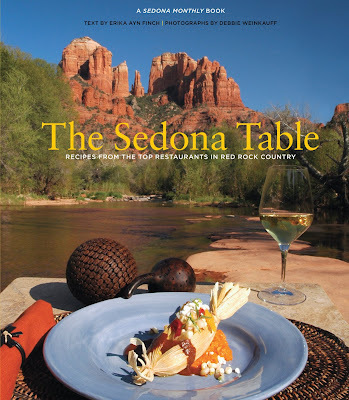 It's the first cookbook focused on Sedona to be published with a major book publisher. The brain child of Deb Weinkoff of Sedona Monthly Magazine sedonamonthly.com , it took 2 years in the making and includes 12 chapters featuring 14 Sedona chefs and a total of 60 recipes. Each recipe has a great color photo and the book is filled with beautiful shots of Sedona, the chefs and restaurants. You can purchase it at www.amazon.com before March 3rd to get a great discount!